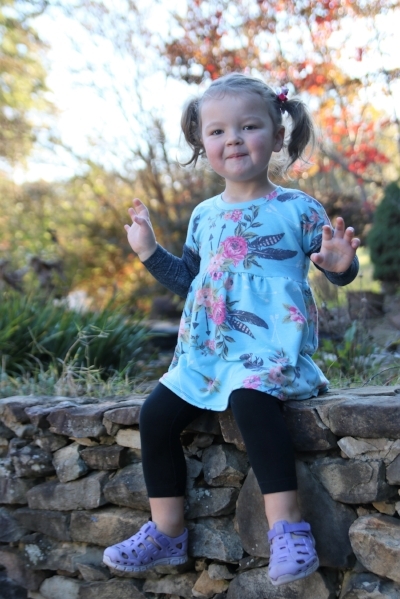 In looking back through my recent sewing pics, I realized that my sweet EC was a little behind when it comes to mama-made clothes, so last weekend I found some time to whip her up a new top. 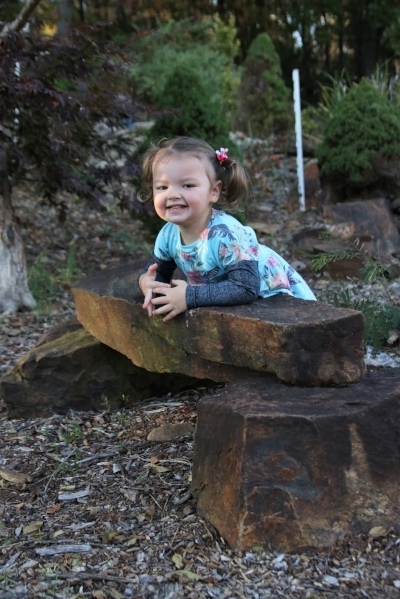 We stumbled on a great sale and bought lots of regular tees and leggings at back-to-school time, but she doesn't have a ton of long sleeve options she likes. I pulled out the New Horizons Girls Dublin Dolman, and grabbed this gorgeous feather fabric from my stash and got to work, crossing my fingers that she would like it, as she wasn't home to approve...too busy having fun with her cousin! In all honesty, the most difficult part of this pattern is deciding what version to make! I actually bought the women's version when it first came out, and am a bit ashamed that I have NEVER made it...I simply couldn't decide what to try first! 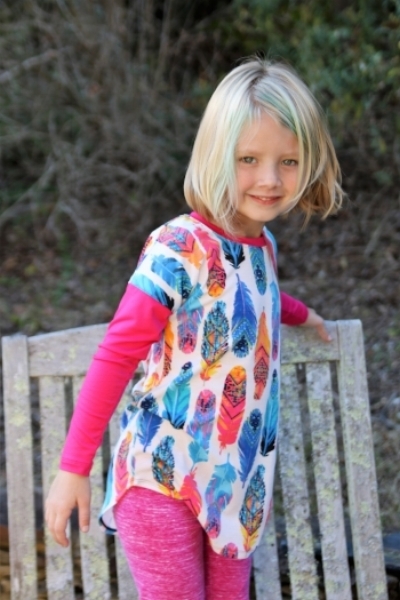 I opted for a long sleeve, basic tunic with curved hem for my girlie...I love that the tunic length gives great coverage with no length adjustments needed! I absolutely love how this turned out and know it will get lots of great wear! The more I looked at the pattern line drawings, I knew I wanted to try the gathered front and back as well...in fact, I couldn't get it out of my mind...so when the kids went to co-op this week, I started printing and cutting, and in a few quick hours, I had this cute little number for my little girlie! Now that I'm roughly a year and a half into my "serious" sewing journey, I have come to realize that I love it when one pattern gives me a large size range, and great versatility. I would rather have a couple of workhorse patterns in my repertoire than a whole bunch of so-so ones. Using one pattern to get multiple different looks is a definite win! Multiplying that times 3 girls = amazing!! I know that I will reach for the Dublin Dolman time and again to fill my girls' wardrobes! So tell me...would you have known these came from the same pattern? One pattern...so many options...I think next I'll try the banded waist...that was until my big girl told me she needs a top to match little sis...now if I could just find more sewing time in the day! 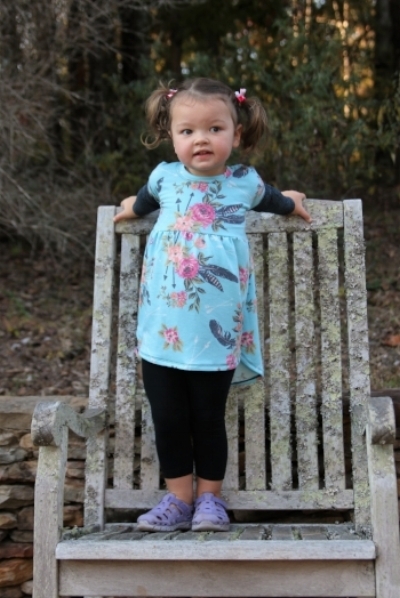 You can grab the Girls Dublin Dolman in sizes 6-12mos - 16 (what a range!) and there's is a lady's version too! Or save more with the bundle! Which option would be your first pick? This pattern was provided to me at no cost as part of the New Horizons Promotional Team. All opinions are entirely my own. Additionally this post does contain affiliate links, that if used, at no cost to you, will provide a little extra $$ for my love of fabric and sewing.